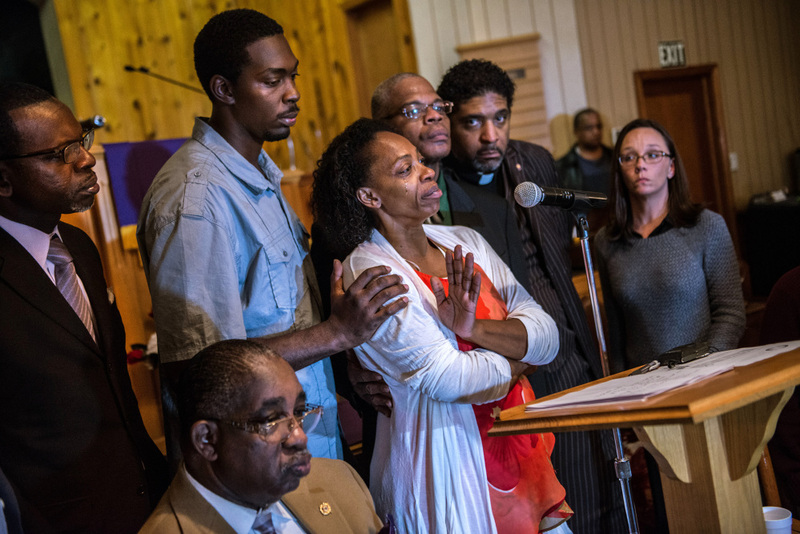 Lennon Lacy's relatives and the NAACP raised doubts about authorities' ruling that his death in August was a suicide. BLADENBORO, N.C. — The black teenager was found in a North Carolina trailer park, hanging from a swing set by a dog leash and a belt that was not his own. His mother said he showed no sign of emotional trouble, yet authorities quickly ruled the death a suicide. Now the FBI is reviewing the investigation after Lennon Lacy’s relatives and the NAACP raised doubts about the official findings, which the county coroner also questions. A 911 caller reported spotting the 17-year-old’s body Aug. 29 in the small town of Bladenboro, about 100 miles south of Raleigh. His feet were suspended 2 inches off the ground. The state medical examiner ruled that the boy killed himself, but his mother said she does not believe it. She last saw the youngest of her four sons alive as the middle linebacker prepared for a high school football game by putting together his uniform in the early hours of the day he died. His father told him that he needed to get some sleep before the game, his first after his mother made him take a year off from the team to focus on his grades. “OK, Daddy,” he said. They then heard a door close, which was not unusual, Claudia Lacy said, because her son liked to run at night when the air was cool. About 13 hours later, she identified his body in the back of an ambulance. The swing set was in clear sight of about 10 trailers. She said she felt let down when investigators ruled it a suicide and brought her concerns to the state chapter of the NAACP, which has organized a march Saturday in Bladenboro. On Friday, federal officials confirmed they were reviewing the investigation. A spokesman for U.S. Attorney Tom Walker said Walker’s office acted at the request of attorneys from the North Carolina NAACP representing the family. Bladen County District Attorney Jon David said Friday that he also asked the FBI to review the case because the family and the NAACP said they had information that they would provide only to federal authorities. He said he had seen no evidence of foul play. “Not only is the case open, but our minds are open,” David said. In the 911 call, the dispatcher advises the caller to try to get the person down in case he was still alive. When investigators arrived at the trailer park that the NAACP has described as predominantly white, the body was on the ground. Investigators told NAACP attorneys that one shoe was on the body and one was on the ground, said Al McSurely, a lawyer working for the NAACP. The shoes were 1.5 sizes too small for Lacy and did not belong to him, his family said. The family also questioned whether authorities took photos at the scene, and if they did, whether those photos were provided to the state medical examiner. David said Friday that many photos were taken, but the NAACP attorneys said they were not aware of any. Bladenboro Police Chief Chris Hunt referred all questions to the State Bureau of Investigation, North Carolina’s top law enforcement agency. A spokeswoman for the bureau has said agents addressed all viable leads. Bladen County Coroner Hubert Kinlaw said he signed a death certificate calling the cause of death a suicide because that’s how the form came back from the medical examiner. Kinlaw, who went to the scene, said he now wonders whether Lennon really killed himself. But the medical examiner, Dr. Deborah Radisch, said in a discussion with a pathologist hired by the NAACP that she based her ruling partially on Kinlaw’s conclusion that Lacy killed himself. And Claudia Lacy inadvertently contributed to the conclusion of suicide. When asked if Lennon had been depressed, she said yes, that his great-uncle had been buried the day before. She said she meant that Lennon was sad, grieving over the loss of a family member, not suicidal.